Nick also tagged his famous wife in the cosy snap. However, eagle-eyed social media users spotted what appeared to be a typo in his caption, referring to “dogs” plural. “He says dogs instead of dog. Typo error maybe,” a fourth social media user wrote. 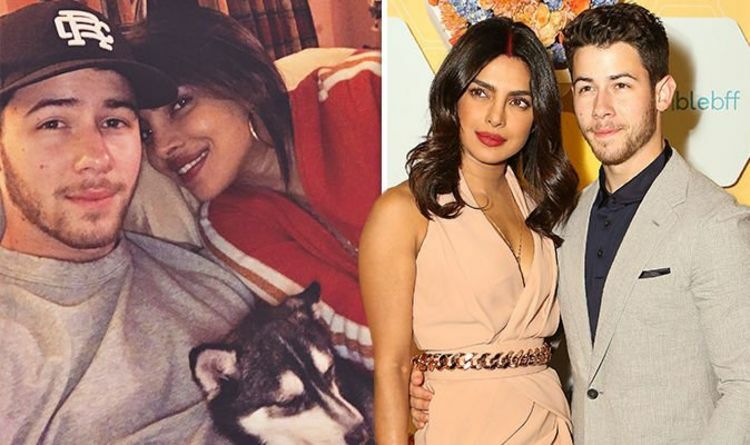 Nick and Priyanka tied the knot earlier this month, holding both Christian and Hindu ceremonies at the Umaid Bhawan Palace in Jodphur, India. They later held a third reception in Mumbai, which was attended by her fellow Bollywood stars. Priyanka’s stunning wedding ensembles have gained plenty of attention, with their first fairytale ceremony seeing her don a breathtaking 75 foot veil. In Mumbai, she wore a pastel blue two-piece with a top and skirt embroidered with delicate floral detailing. The crop top showed off her slender midriff as she posed for pictures with her former Jonas Brothers star beau. It also featured dramatic oversized sleeves which trailed down by her sides. Nick, meanwhile, looked dapper in a dark green suit over a black top. The couple first started talking via direct messages on Twitter back in 2016. They later met at an Oscars after party in 2017 and got engaged this summer. More Salad Shake Ups recalled due to possible Listeria contamination Selling Real Estate in Russia? Are You Crazy?